There is simultaneously a great wealth and great lack of information about the Bjicks who left Pomerania in 1863. They sailed from Hamburg and arrived in Quebec, where the immigration clerk misspelled their names in inventive ways. How they crossed the border into the U.S. and traveled to Chicago is unknown. Much of the confusion about the family has to do with the loss of government and church records around the world wars, and with the shifting of borders. Most of the town names in the existing documents were located in Germany in 1863, but became Poland after 1945. Family members identified their place of origin in Germany as Stolp, Preußen or Stolp, Pomerania. The ship’s manifest for the arrival of the Bjick family lists their point of origin and home as Rexin, Germany, now Rzechcino, Poland. Pomerania-Stolp (German: (Teil-)Herzogtum Pommern-Stolp, Polish: księstwo słupskie, “Duchy of Słupsk”) was one of the partitions of the Duchy of Pomerania (German: Herzogtum Pommern). Centered in Słupsk, it was created from another partition of the Duchy of Pomerania, Pomerania-Wolgast, to satisfy Bogislaw V, Duke of Pomerania in 1368, and existed until 1459, when it was inherited by Eric II of Pomerania-Wolgast. In 1474, it was merged to the partition of Bogislaw X, Duke of Pomerania, who four years later became the sole duke of Pomerania. Rzechcino [ʐɛxˈt͡ɕinɔ] (until 1945: Rexin) is a village in the administrative district of Gmina Potęgowo, within Słupsk County, Pomeranian Voivodeship, in northern Poland. It lies approximately 6 kilometres (4 mi) north of Potęgowo, 29 km (18 mi) east of Słupsk, and 79 km (49 mi) west of the regional capital Gdańsk. […] In 2010 the village has a population of 380. Carl Bjick, his wife Augusta and their children ages nine to six months immigrated in April of 1863, coming into the States through Quebec, Canada. Carl and Augusta are EEG’s fifth great grandparents through her mother’s maternal line. Their family page in the database can be seen here. As this ship’s manifest indicates, a 17 year old Richard Luedtke was traveling with the Bjick family. Augusta’s maiden name was Luedtke, and Luedtke’s pop up all over the place in close proximity to the Bjick family into the 20th century. 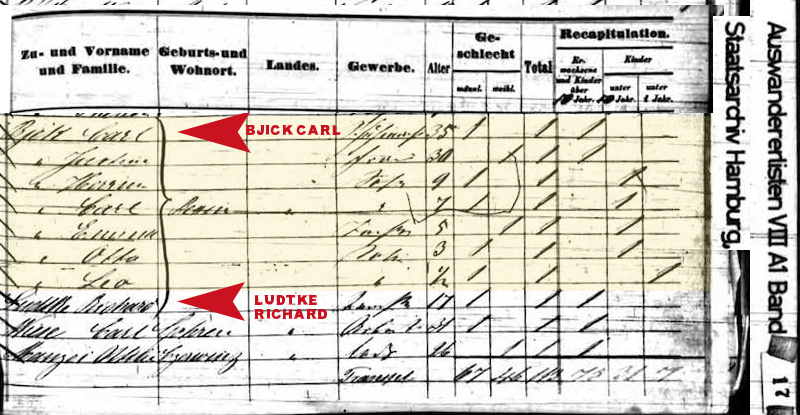 There are both a male Bjick and a male Luedtke of the generation before Carl and Augusta, their fathers or uncles, buried in the family plot in Chicago. Thus far I’ve had no success in tracking down any information about either of them. 1863 Arrival in Quebec as immigrants. Click for a larger image.